How about an ambiguous hump to start your Valentine’s Day ? 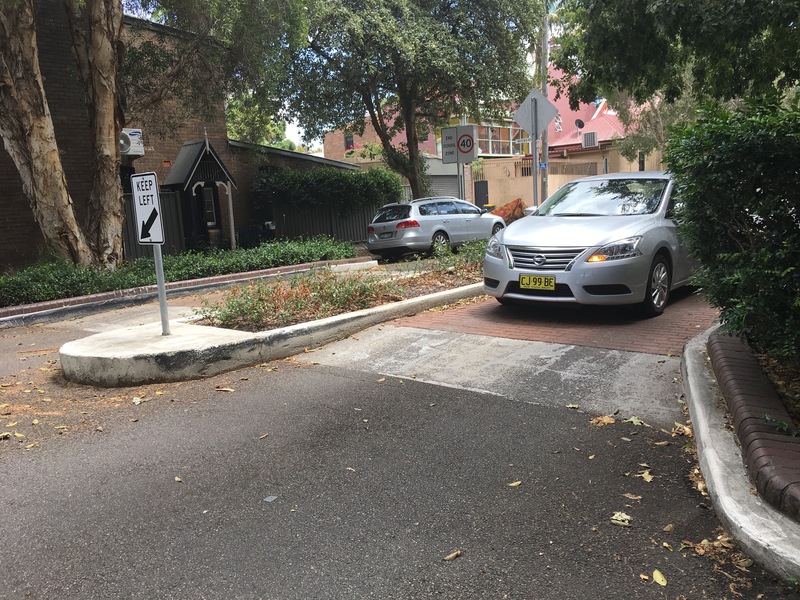 Pedestrian / street interfaces in Sydney are needlessly inconsistent. When is a Speed Hump (Speed Table) also a Pedestrian Crossing? When is a Pedestrian Crossing also a Speed Hump? When the traffic engineer felt like it. Walking about Sydney, we see all sorts of cases. I propose a simpler rule: All high demand pedestrian crossings should be speed humps on the road (the should rise to the sidewalk level). All low demand roadway/sidewalk crossings should be speed humps so that these road and especially laneway (alley) crossings extend the sidewalk across the road (so the pedestrian is not lowering themself crossing the street, but rather the car is slowing and rising while crossing the sidewalk). I have photos illustrating good, bad, and ambiguous examples from Sydney. A raised sidewalk across a laneway (alley) at Broadway Shopping Center. This is also excellent, and should be ubiquitous at every laneway in Sydney. The pedestrian is giving me the side eye for taking his picture, but he is important to illustrate traffic safety. 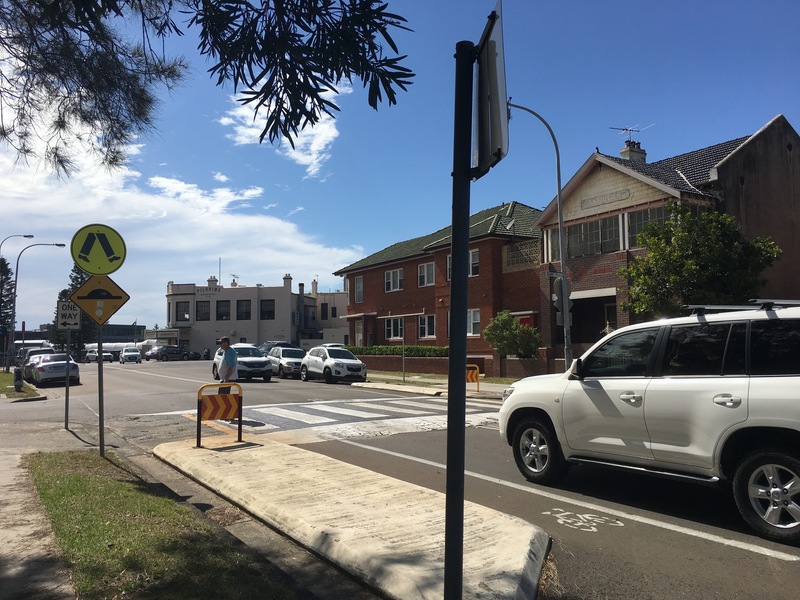 Raised pedestrian crosswalk in Cronulla. Similar to the first example at Broadway, but a much less trafficked intersection, with a too narrow bikelane on the side. The sidewalk comes down to the street before the pedestrian rises above the street, and then returns to grade before the next accessibility ramp. Not quite an elegant solution. Redfern Station Entrance. There is no marked crosswalk, much less a speed hump or raised sidewalk here, despite the huge demand. There is however a speedhump just to the east (left) of the picture for some reason. A missed opportunity. No marked crosswalk means pedestrians must yield to cars. The intersection of Abercrombie Street and Cleveland Street in Darlington (Chippendale is across Cleveland) sees a speed hump on Abercrombie between Hudson Street (the lower right) and Cleveland (upper right). Pedestrians are continuously crossing in this stretch, but the speed hump aligns with neither unmarked crosswalk (at Hudson/Abercrombie nor Cleveland/Abercrombie). Still, it’s begging for pedestrians to use it, and they do. A signalized but porkchop-islanded crosswalk at a Free Left (Free Right for those in the right-side drive countries) (Broadway and City Road). Notice the pedestrian light is red (don’t walk) but the pedestrians cross anyway. If the free left is not eliminated in a more comprehensive redesign, it could easily be de-signaled and the crosswalk raised, so pedestrians dominate, and cars travel when they can. This speed bump in Alexandria Park does not want to be mistaken for a pedestrian crossing, so it is landscaped wherever a pedestrian might think of crossing. This is just before the actual intersection, on an extensively calmed street. Cars race from calming device to calming device, treating the chicanes the way a skier might.